As the island’s only temple, Wat Ko Phayam overlooks the east coast and includes one of the island’s signature features: a wihaan that appears to hover above the ocean like a giant white birthday cake. Browse places to stay in Ko Phayam on Agoda.com. Free cancellation. Accessed by a long cement pier marked by a Dharma wheel on the gate, this structure is like no other wihaan we’ve seen. It’s decorated with eight wooden doors in faded crimson, topped by a standing Buddha image and tiered umbrella that looks like a candle, and punctuated on the lower edges by white depictions of lotus leaves that look very much like frosting! Several ordinary Buddha images sit in the interior shrine. It’s a memorable place to meditate as the sea splashes below and sun rays reach inside. 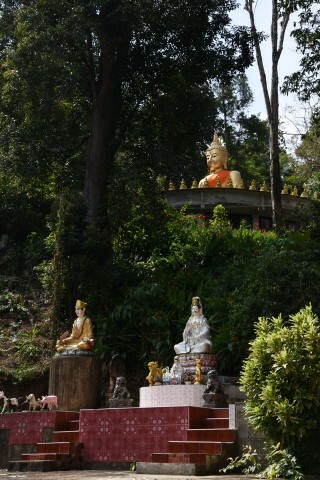 You’ll also find a large gold-painted Buddha image seated high up on a hill draped in blossoming trees. Other statues include a depiction of Kuan Yin, “goddess” of mercy, and a lineup of four Yaksha guardians. At a little shop selling Buddhist amulets, a gently smiling monk tied a white piece of string around our wrist as a blessing. We also saw a hermit monk donning heavy talismans and lots of sak yant tattoos. Wat Ko Phayam can be reached by the lane shooting south from the main pier in the village. Admission is free.